photo: Charles Perry Hebard, courtesy of the Al Cohn Memorial Jazz Collection. Raised in Yardley, Pa, Rick was fortunate to have a dad who played trombone (for fun) and a music-loving mom; they steered his early studies to Ed Cook of Trenton, NJ and later steeped him in big band, dixieland and classical experience. At 14 Rick attended Ramblerny Camp for the Performing Arts where Phil Woods was director of the Jazz program. (He first performed parts of the Children’s Suite there.) He was fortunate to be in the Pennsbury Schools with their esteemed music program as he was beginning his career as a musician – club dating, playing shows, big band gigs and symphony work (including becoming a member of the Trenton Symphony Orchestra at 16). While Rick was in high school, the great arranger/band leader, Johnny Richards, introduced him to Wayne Andre, and so began travels to New York City for lessons and learning opportunities such as sitting in with Clark Terry’s big band. The summer of 1970 began his long association with the Pocono Mountains of Pennsylvania, working at Mount Airy Lodge and experiencing the Deer Head Inn jazz scene. Next it was off to the New England Conservatory of Music in Boston, MA during the “Gunther Schuller era.” At the suggestion of Harvey Phillips, then the Conservatory’s Vice-President, Rick began his relationship with John Swallow, first as a student and then later as a colleague and friend. In Boston he developed an extensive freelance career, performing big band jazz (Herb Pomeroy), Dixieland (Your Father’s Moustache), and classical music. Summers were spent performing with the likes of the Nantucket City Band, the Red Garter in Wildwood, NJ, and the Brockton (MA) Symphony. For a year and a half he traveled throughout New England with the Berkshire-based jazz/rock/swing band, Goodfriend Coyote. Following graduation with a Bachelor of Music degree in Trombone Performance, Rick moved back to the Pocono Mountains to work at Mt. Airy Lodge, Tamiment, and many other resorts during the era that presented big-name acts and hired full bands. He soon became a charter member of Asparagus Sunshine(where he was also a composer of The Jazz Mass), reunited with Phil Woods and, along with Eddie Joubert, founded the Delaware Water Gap Celebration of the Arts. The vast and diverse world of the New York freelance scene beckoned and Rick made the rounds of Broadway pit bands, the jingle recording scene, performing, recording or touring with the likes of Louie Bellson, Engelbert, The Band of America, Bill Watrous, Chuck Mangione, Joni Mitchell and Gerry Mulligan. He reconnected with his former mentor, John Swallow, and began the path to which he presently adheres, that of a New York freelance classical musician. Rick is the principal trombonist of the New York City Ballet Orchestra, American Composers Orchestra, and the Westchester (NY) Philharmonic, performs with the Brooklyn Philharmonic, The New York City Opera, the New York Pops (among others), and has recorded for Live From Lincoln Center, many contemporary ensembles, and even The Village People. 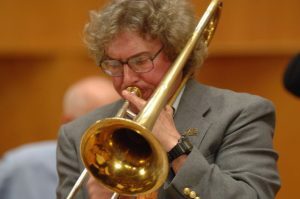 West of the Hudson, Rick played in the Little Big Band and Festival Orchestra with Phil Woods, JARO, the Gaptime Ensemble, the Dixie Gents, Eric Doney, the Tony Gairo/Gary Rissmiller Big Band, Zen for Primates, and taught at Lafayette College. Rick was always an active community member; he had been a board member of Children and Youth, and The General Authority, and served on the Borough Council of Delaware Water Gap for 12 years (many as President), as well as staying active in COTA. He has a wonderful extended family and made his home in South Stroudsburg – just over the hill from the Gap. Chamberlain passed away in March of 2015, and the camp continues to honor his legacy and love of jazz.